Sunset Lagoon, a spectacular 3,840-square-foot waterfront home, was completed in 2009 fulfilling the developers’ lifelong dream of owning a home in a sheltered deep water location at the entrance of Leisure Lee Waterways. 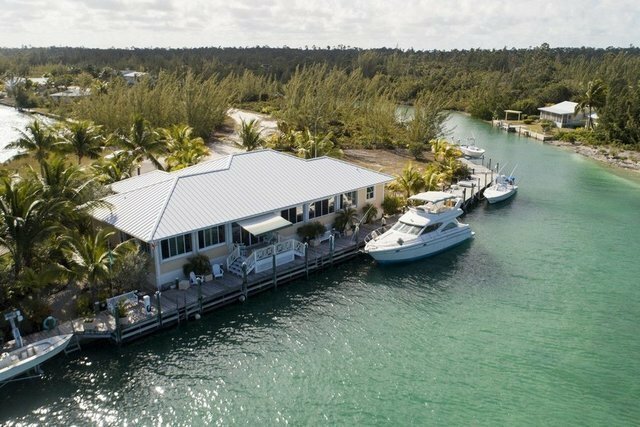 For nearly a decade, the homeowners have enjoyed cruising their yacht and runaround boats to and from the Sea of Abaco and taking in the pink and yellow hues of the setting sun shimmering off their beautiful bayside lagoon, hence the home’s name. Built to withstand the elements, the 3-bedroom home features CBS construction and poured concrete. Both the metal roof and large walk-around attic, which runs the length of the house, are insulated with spray foam, and all windows and the entrance door are PGT hurricane-resistant. “Big Bertha” accordion shutters protect the expansive patio, and there are extra hurricane shutters for all windows. Additionally, the garage door is hurricane enforced. Each of the home’s en suite bedrooms are expertly planned. The master offers a spacious walk-in closet, huge master bath with walk-in shower, and an adjustable motorized bedframe for elevating your head and feet. A second bedroom features a king size bed, walk-in closet and smart TV cabinet. The third bedroom, currently being used as a combination office and art studio, opens onto the patio through a cabana door. All beds are part of "The Adjustapedic Collection" and have Swiss Sleep System mattresses (European Tempurpedic). The expansive gourmet chef’s kitchen features porcelain countertops with a mosaic stone tile backsplash and an island with a separate prep sink leaving plenty of space for countertop appliances and food preparation. Cabinets are pull-out shelf technology making utensils easily accessible and a separate butler’s pantry has an additional refrigerator/freezer for extra food storage. All appliances are Whirlpool Gold stainless steel and include a double-wall oven, a 36-inch French door refrigerator, a 36-inch glass ceramic cooktop, dishwasher, under counter 50-bottle wine cooler, and a built-in 30-bottle wine rack. The home’s spacious living area features expansive 11-and 12-foot sheetrock textured ceilings and is surrounded by windows providing mesmerizing views of the bayside lagoon and Sea of Abaco. The 8,500-square-foot lot features 163 linear feet of water frontage, a 150-foot dock, 6 feet minimum water depth at low tide and three professional marina power posts with lights, water and electric for 30- and 50-amp service. There is also a 10,000-pound elevator boat lift at the end of the dock. A 10’ X 12’ deck shaded by a SunSetter Awning is ideal for lounging in the outdoors and an enclosed outdoor shower provides refreshing water for cleaning off the salt and sand after boating trips.